Back in December Connie told you about #57, a Kemp's ridley sea turtle with severe pneumonia (see past posts here). 57 went through intensive treatment of nebulization and injectiable antifungals and antibiotics. Once he was eating regularly we switched him to oral medications. 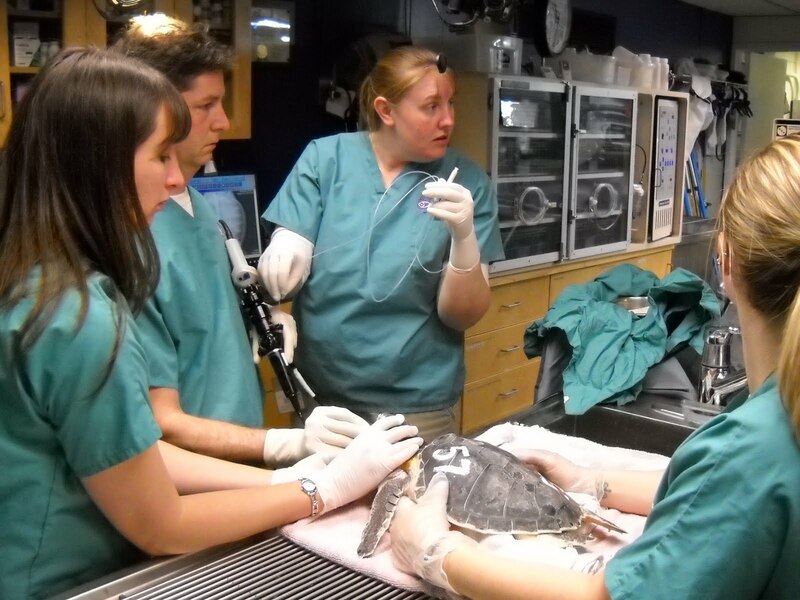 Over time, radiographs showed some improvement so we stopped nebulization after the 4 weeks. Unfortunately within a couple weeks he relapsed and had to be nebulized for another 4 weeks. After some improvement, radiographs from April again showed a relapse. Although he is no longer being nebulized, we have been doing many diagnostic procedures to figure out the best way to treat his pneumonia. 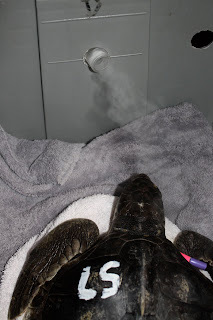 57 being nebulized in December. Radiographs in April showed an extremely dense area of 57's right lung (appears on left side of the picture), which is a sign of pneumonia. 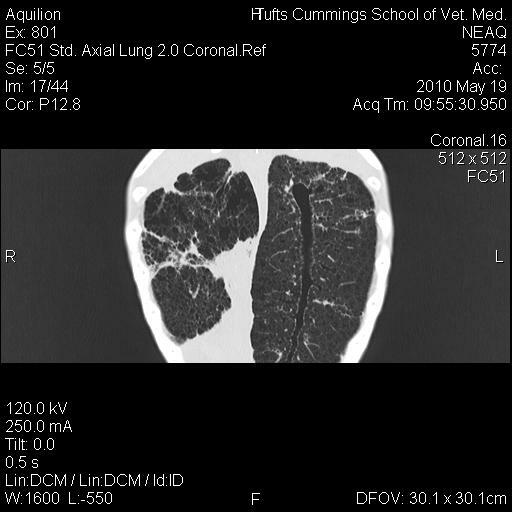 A bronchoscopy was performed on 57 to diagnose whether the infection in his lungs was caused by bacteria or fungus, or if it was fibrotic (scar) tissue from the previous infection. 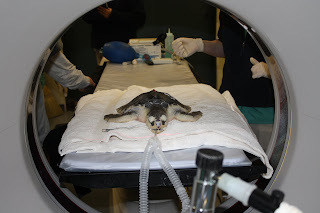 See the post about bronchoscopy from another turtle here. The results from 57 came back as a fungus present and a mycobacterium species (a type of bacteria). Based on these results we were able to change his treatment to medications that are more specific to the type of infection. Last week we brought 57 to Tufts Cummings School of Veterinary Medicine for another CT scan (his first one was in February) for further analysis of his lungs. The results confirmed the consolidation of his right lung. In the above picture note the dense white area of the right lung compared to the left. 57 continues on his medications and we are making arrangements to perform a lung biopsy on him in the coming weeks. You may remember a lung biopsy being done on Orion last year. Based on where the infection is in 57, we will likely have to approach from the ventral side using laparoscopy instead of drilling a hole in the carapace as we did with Orion. Thank you to all the staff from Tufts for helping with the CT scan. We will keep you updated on 57's progress!